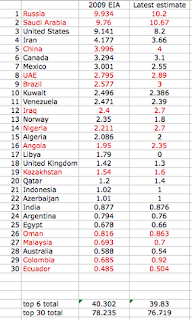 When I first began this review of future production from the different oil producing countries about fifteen months ago, I produced this list of the relative performance of the top 30 producers. China’s supply is expected to average 4.22 mb/d in 2012, an increase of 80 tb/d over 2011 and steady from the previous month. China’s output in May averaged 4.19 mb/d, also steady from the previous month and the same month last year. 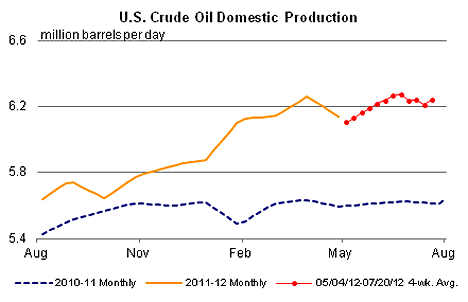 However, cumulative production till May 2012 indicates a decline from the figure for the same period in 2011. This has been mainly due to the shutdown of the Penglai field, while healthy production from the Changqing field, which reached a record level in May after 40 years of operation, has partly offset the decline. As the initial table above shows, China has been lagging Iran in production, but even as China has grown production, that in Iran has slipped. 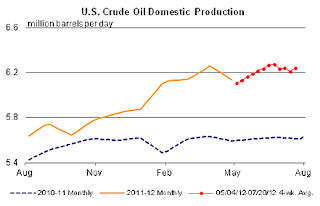 OPEC report that (again depending on who one believes) Iran is producing between 2.96 and 3.76 mbd. (The latter is the Iranian number). Iraq is still running either slightly ahead or behind at 2.98 mbd. 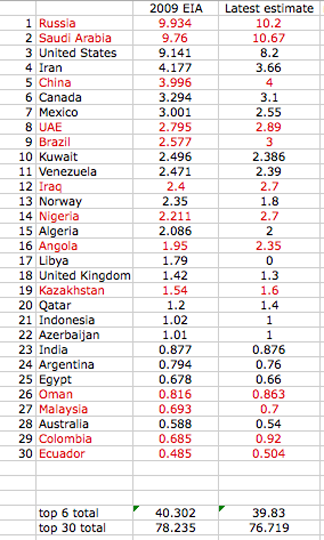 Iran may therefore be moving from 4th to 6th in production rank. 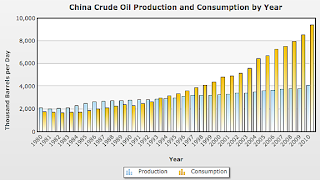 Even as China’s production has crept up, and against an EIA estimate of 20 billion barrels of reserves, these numbers are being dwarfed by the rate at which demand is rising. The EIA notes that this ranks the country as second (to the USA) both in terms of overall consumption, and also of imports (running at around 5.5 mbd). the acquisitions will help China "lower the risks when energy shortages become an urgent problem in the global market." Also this week Sinopec bought into 8% of the production from the United Kingdom (1.8 boepd) as it purchased 49% of Talisman. 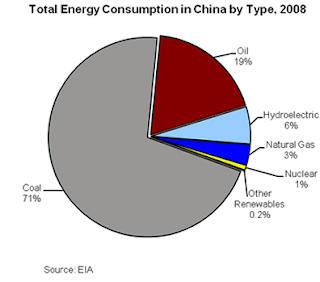 At a time when India has just emerged from two days of blackout vulnerabilities outside of the availability of the fuel itself are ubiquitous and equally well hold true in China where both domestic and imported fuel must make its way through a crowded infrastructure to the point of use. Oil and natural gas are more easily transported in pipelines, though the large distances and the mountainous terrain in regions of the country does not make that construction easy. China has, however, been willing to invest in such pipelines to gain access to, for example, natural gas supplies from Turkmenistan. Until the advent of the pipeline in 2009 the Turkmen were stuck with having to sell their natural gas through Russian pipelines into Europe, and had to take the price that they were allocated. With the opening of a second market, this was foreseen as a considerable boost to both countries. However there have since been some further negotiation of price, as the global market has changed. Those negotations are now complete and flows will increase to some 65 billion cubic meters/year (bcm/yr). It is anticipated that this will cut the need for China to import additional volumes of natural gas from Russia. To date some 20 bcm have been shipped from Turkmenistan through the 1,830 mile pipeline since it opened in 2009, and field development in Turkmenistan is proceeding to provide the volumes required by the new agreement. 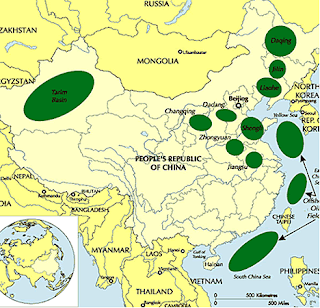 In terms of their own resources China has a number of large oil fields, ownership of some of which (the offshore ones) is not always completely agreed. Figure 5. 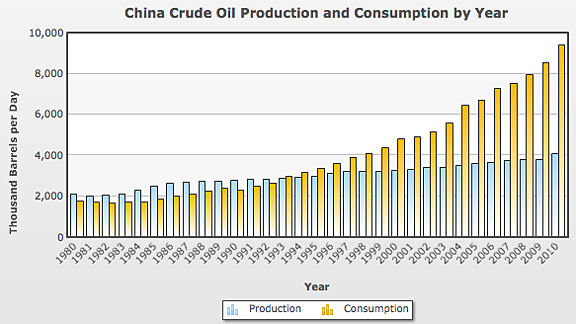 Major oilfields in China (Rigzone via EIA ). The development of natural gas resources from shale has yet to begin in China, but as the Polish experience has shown, it is too early yet to predict that this might achieve the success of that in the United States. As with oil China has significant quantities of coal, but still imports large quantities from abroad to meet the distributed demand across the country. It is not used purely for electric power generation, in the far West houses are transforming from mud brick to baked brick, with all the local brick works fired by coal, in a region which otherwise gets its power from hydro-electric plants. 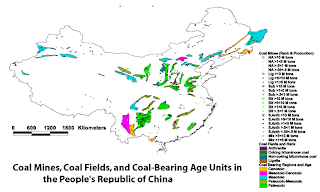 There is, in short, a fair amount of complexity to the Chinese energy story, which will form the focus of the next few posts. For those interested I have listed those posts in an archive for each that is given at the bottom of this column.